The cement might still be wet, but Geordie Wilson, Xander Tachinski and everyone associated with the Winnipeg Rifles are convinced the foundation they are building has been set. And now the 2017 season – which opens Saturday night in Ottawa in an inter-conference game against the Sooners – is all about putting up walls and a roof and turning the Rifles into a Prairie Football Conference contender. “I wish I could wave a magic wand and have this built overnight,” began head coach Geordie Wilson, heading into his second year as the Rifles boss, in a chat with bluebombers.com. “This franchise has never really had sustained success in its existence (founded in 1999). There were some flashes when Mike Watson was the head coach and some sporadic seasons here and there. But there hasn’t really been a good solid foundation built. 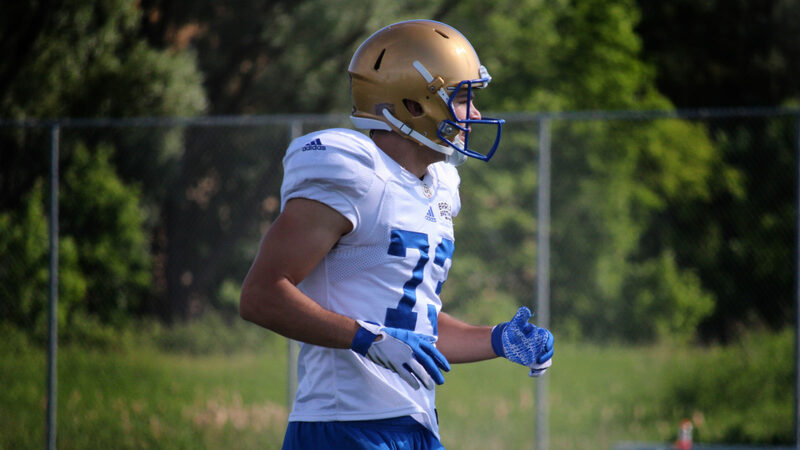 “I look at us to be like the Bombers when Kyle Walters and Mike O’Shea came in… if you want to have a good house, you’ve got to make sure you have a solid foundation. We’re at the point now where we really think we’ve got some good building blocks in place. We have good people and we have good players. I feel good about what we have, but now we’ve got to see it. The Rifles were 2-7 last season and Wilson’s goal – obviously – is for the club to compete for a national championship. Realistically, the next step is for the club to first make the playoffs and perhaps play host to a playoff game. 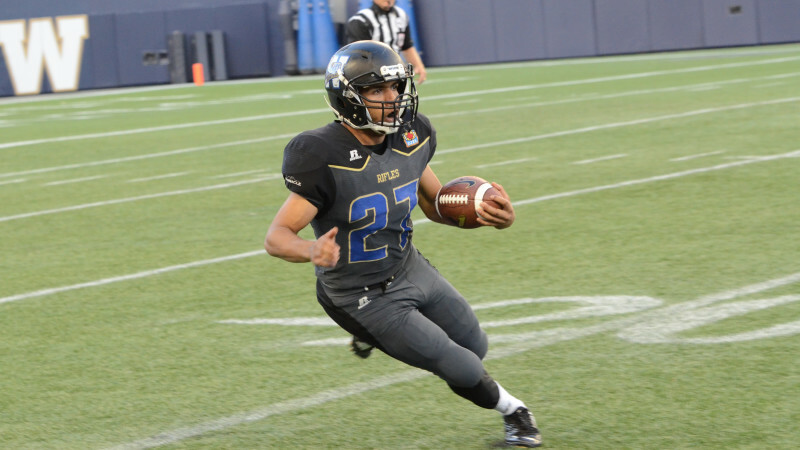 The Rifles have some intriguing pieces, led by the four players who attended Bomber training camp: Running back Michael Ritchott, defensive back Andrew Ricard and receivers Brendan Naujoks and Xander Tachinski. Tachinski, who continues to practice with the Bombers during the day before joining his junior squad for evening practices, is the Rifles’ team captain. Tachinski is entering his fourth season with the Rifles and the transformation in the franchise is happening right before his eyes. 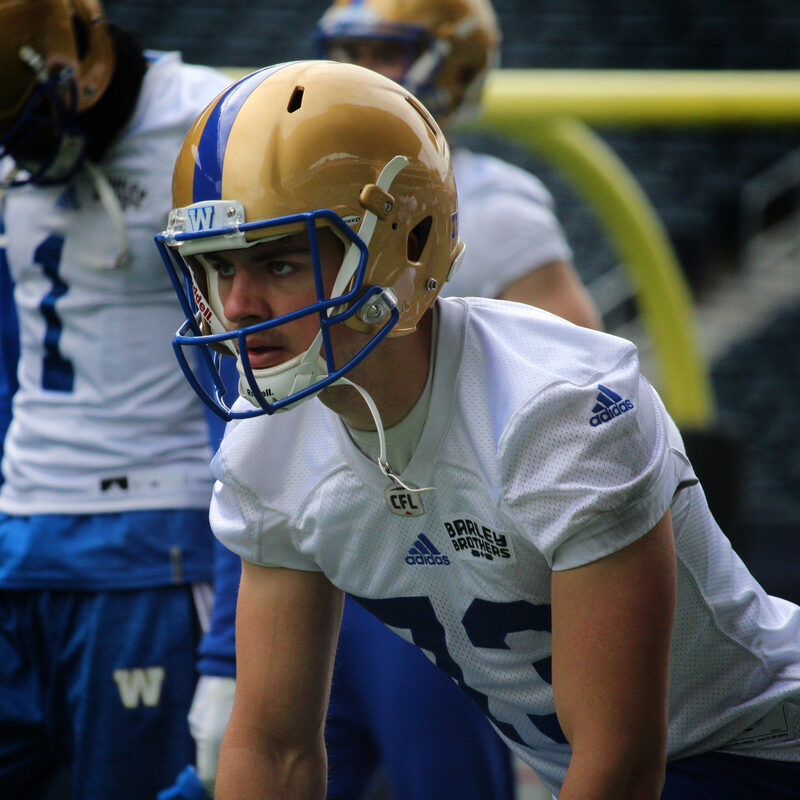 “We have a lot of great people and that’s an important thing,” said Tachinski after Bomber practice this week. “We’re really a team at this point. We’re a young team, but we have a lot talent. I’m excited to see where we’re going. “When I first came in, it seemed it was more about just building the talent base. But we had so much coaching turnover and some of the bad characters came out and the Rifles went into a downturn. Jon Remple is the starter and entering his final year with the Rifles. Wilson describes him as a running-type QB who is at his best rolling out and moving the pocket. Wilson is thrilled to have two tailbacks who can be difference-makers in Ritchot and Odun Ogidan. The team’s strength, according to Wilson, are the defensive line and receiver positions. DL Machuok Akau went from Oak Park to Carleton, but suffered a knee injury and is healthy again. Also singled out by the head coach were DL Hayden Nellis, Erik Gislason, Samson Harper and Justin Kwiatkowski. The receiving corps features Tachinski and Naujoks, along with Kai Madsen and Griffin Shillingford, who comes aboard after playing at Mount Allison University. The Rifles leave Saturday morning for Ottawa and face the Sooners at 6 p.m. CT at Keith Harris Field. The game will be streamed live through Sooners TV, with a link to be available on the Rifles website. Winnipeg’s PFC schedule begins Sunday, August 20th at 1 p.m. against the Saskatoon Hilltops at St. Vital Mustangs Field.